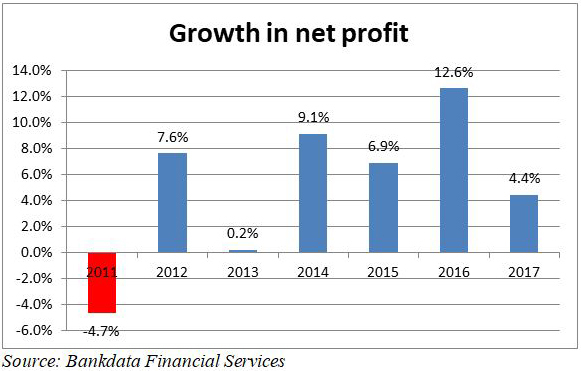 The Capital Adequacy Ratio (CAR) of banks rose to 16.82 percent at the end of 2017 from 16.49 percent a year earlier, according to the ‘Lebanon Banking Sector’, a report by Bank Audi released in September. The CAR continues to improve beyond the Basel requirements “reflecting an adequate coverage of the aggregation of credit, market and operational risks,” the report said. 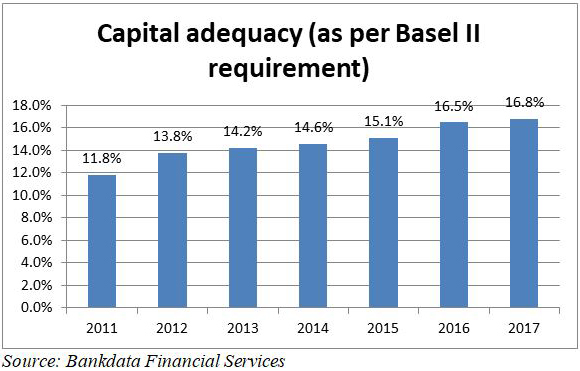 In compliance with the Basel requirements, banks are required by the Central Bank to reach a CAR of 14.5 percent at the end 2017 and 15 percent at the end 2018. The ratio measures the adequacy of a bank’s Tier 1 and Tier 2 capital to absorb losses from risk-weighted assets (RWA). The banks’ combined Tier 1 and Tier 2 capital stood at $23.1 billion at the end of 2017 while their RWA totaled $137.3 billion. The RWA accounted for 53.3 percent of total assets at the end of last year down from 54.1 percent in 2016. The banks’ shareholders’ equity grew by 6.6 percent to $24.7 billion at the end of 2017. Return on average common equity fell to 11.76 percent from 12.18 percent. Amine Awad, General Manager at BLOM Bank, said: “The banks are in a comfortable zone regarding capital adequacy and therefore they don’t have to focus too much on raising the CAR.” One of the reasons that return on equity is falling is that CAR is rising and so the banks should also think of profitability and balance profitability and exposure, he said. According to the Bank Audi report, return on equity continues to lag behind the overall cost of equity due to tough operating conditions locally and abroad. The return on equity is positively correlated to the size of banks with the group of largest banks, or ‘Alpha’ banks, yielding the highest ratio of 11.27 percent. 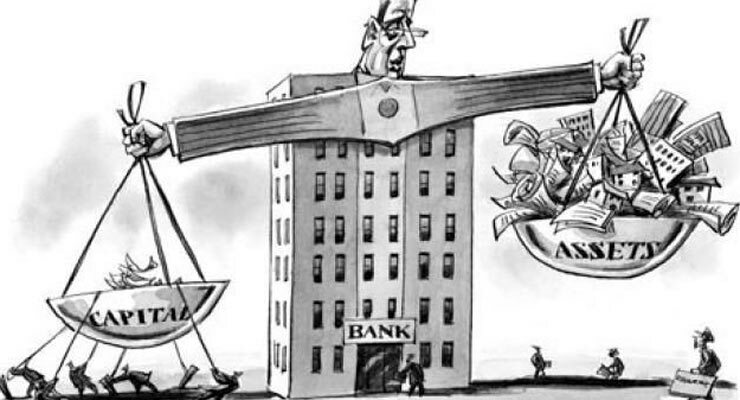 The lowest ratio – 4.78 percent – was recorded by the ‘Gamma’ banks, which includes the smallest banks. The leverage ratio of average assets to average equity continues to drop reflecting rising capitalization. 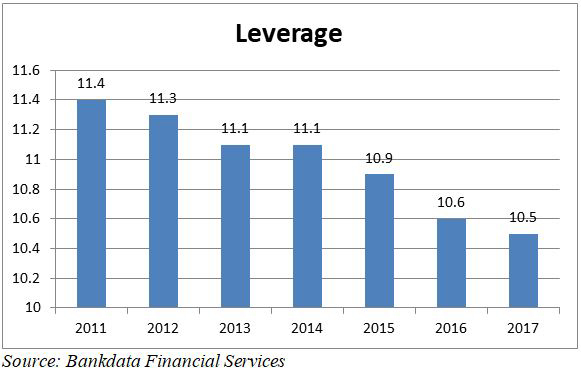 The leverage ratio fell to 10.45 in 2017 from 10.63 in the previous year, according to the report.